Having trouble conquering those intimidating bosses in Dark Souls? This latest video won't help you at all. It will showcase some of the colossal beasties of Lordran. 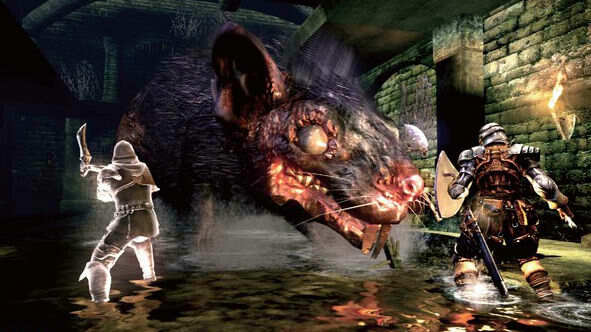 This giant rat is the least of your worries, especially when you've got monsters like the one at the :40 second mark coming after you. I can handle half naked giant spider ladies, but that tongue and teeth guy totally freaks me out. If he get's a hold of you he swallows you whole! We also have some news on the organized multiplayer disaster. From Software has announced that a patch is in the works. The details have been spotty at best, since the best source seems to be a Google translation of their Japanese home page*. Details follow the video. Magic Shield/Strong Magic Shield: I know from experience that the Strong Magic Shield spell seemed to make my character temporarily invincible, which is kind of cool, but it also destroys any sense of accomplishment when you can totally crush a boss. Fog Ring: This ring makes players nearly invisible. It's gives the wearer a huge advantage, because not only are they invisible, opposing players can't lock on to them in versus multiplayer. That means most spells, projectiles and stabbing weapons are rendered useless. Some people hate it, while other weaksauce, no-skill-having a-holes like it. I refuse to take a side. Tranquil Walk of Peace: I don't use wussy miracles, so I have no idea how this works. Maybe you say a little prayer, which then transports you and your enemy to a beach. There you hold hands and watch the sunset or something. Maybe From Software will just rename the miracle "Slow," since I think this is the same thing that the Darkwood Stone Knights like to cast on me. Right before I kill them. Infinite use of magic and items: If you want to break the game you can Youtube the different glitch techniques. You could also simply not play the game, since you won't really be playing it. I'll make a deal with you, send me $60 bucks and I'll tell you how it ends! Hint: Awesomely. I've been standing here for five hours. Have to pee soooo bad. This had better be worth it. This is all well and good, but what really caught my eye was this statement: "Conditional matching defects and load when switching - Map." There's also a similar comment on From Software's blog: "Conditional matching adjustments, such as trouble reading maps at switching - improved." Some people are hoping these "multiplayer adjustments" will make co-op matchmaking easier. Excuse me while I editorialize: I seriously doubt this will ever happen. The ability for players to join specific games was a workaround from Demon's Souls. It was never an intended feature. This is one of the many things that made Demon's Souls so popular, both with co-op players and players who held organized PvP tournaments. This workaround was "fixed" for Dark Souls, making it incredibly difficult to meet up with specific players. We have yet to receive any new information from Namco Bandai, even though we were told by a representative that a statement concerning co-op was forthcoming weeks ago. (I don't blame the rep. He does a great job. I also understand things work from the top down. Besides, Namco Bandai is probably still waiting to hear from From Software.) It appears Dark Souls will continue to be a random online experience, rather than a true co-op game. This makes me a sad Hollow. I could be wrong. From Software could implement a friends list and a lobby system! They could, but they won't. Despite the disappointing co-op, Dark Souls is still a heck of a game. 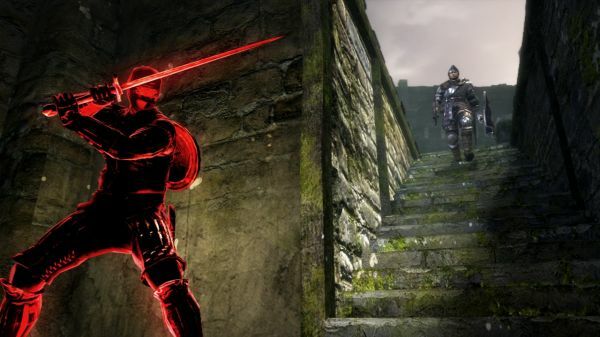 Dark Souls is out now on the Xbox 360 and PlayStation 3. The patch is expected to hit both systems, we just don't know when. It supports three random players in an online experience. It's a damn fine game. It's just not very co-op friendly. For more details on how the online multiplayer works, you can check out our Dark Souls Co-Op Video FAQ. *Thanks to Jason Hawes for the tip.